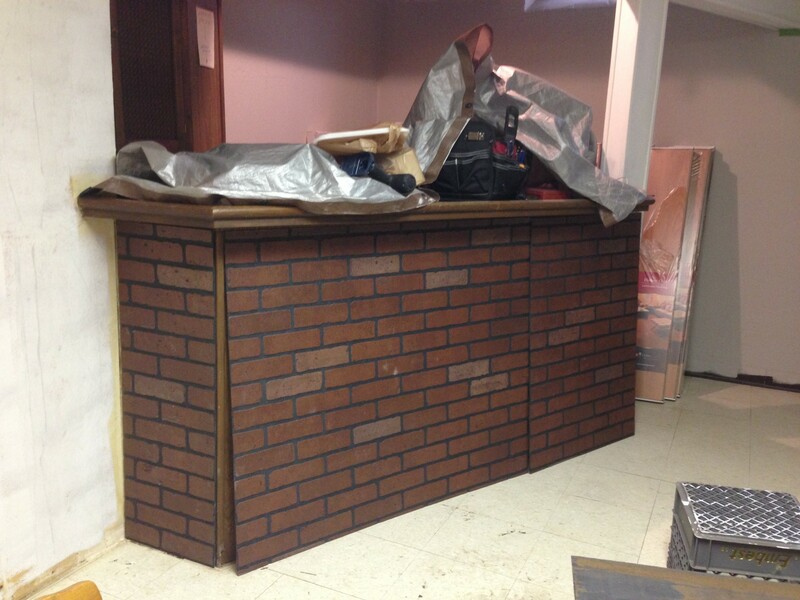 Okay, we didn’t really spend the entire day at the bar, no, instead we spent the entire day working on our bar. If you’ve been following our basement facelift then you’d know we have this cool, OLD, dry bar that we were hoping could be restored and updated without too much demolition. 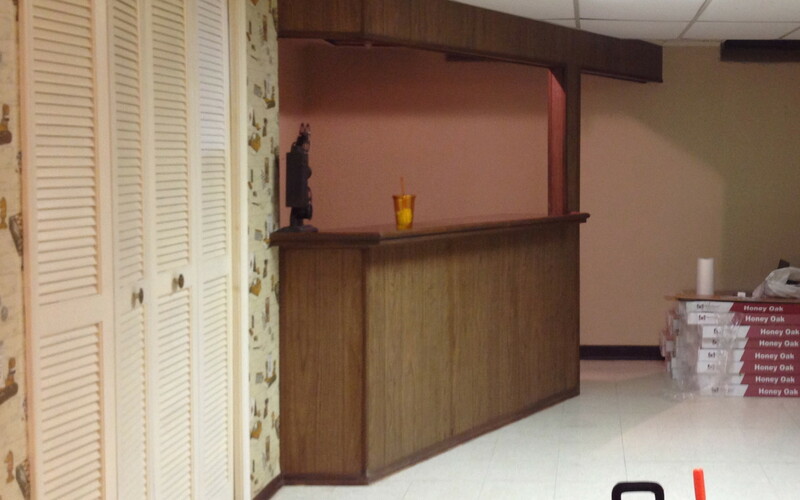 So we began by priming and painting the nasty old wood paneling. We decided to go with a simple white hoping it would help lighten the heaviness of the bar in the room. So far so good. But the base needed something else, something unique. In our mockup on photoshop we faced the bar with white brick. I had in mind to use these brick panels from Lowes so we went to the store to check them out. They are very realistic for being as fake as they are. They are textured, shaded, and raised. And at only $26 bucks a panel we were sold. Unfortunately due to the width of the bar we needed to buy 2. Still $52 wasn’t bad. Lowes cut them to height for us but the gentleman helping us seemed kind of upset that we were asking him to cut these panels so I was too chicken to ask for him to cut them again lengthwise. Fortunately, this ended up being a good decision as we needed to match up the brick on the panels to make it look right. After picking out the right pieces I cut them to size, lathered on a bit of liquid nail and stuck them in place. Don’t judge… we hadn’t glued them down yet. Actually, we were super happy with how realistic they looked not to mention it added a touch of awesome texture to the bar. (side note: if you were wondering, we will eventually caulk that seam to blend together the two panels but for now, we’re living with it). Although it was all looking great, it was still too dark for our taste and since it seems like painted brick is in these days, we decided that is the route that we would be heading down. Too bad we didn’t get to it on day 3… Guess you’ll have to wait until day 6! 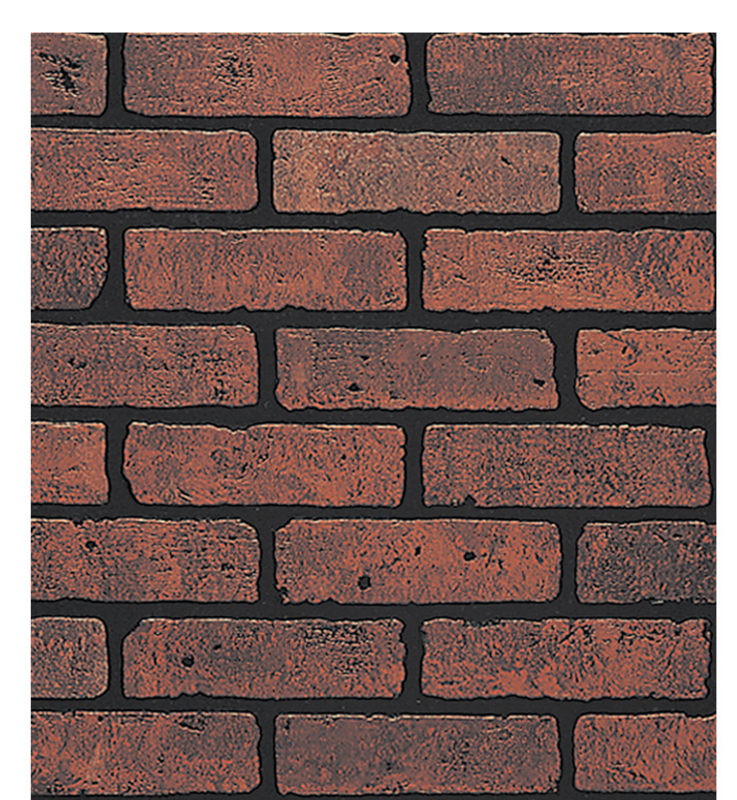 Have you had any experience with faux brick? Or have you found anything better than what we used? Where did you use it? I read quite a few reviews of people actually using these to cover up crumbling brick on the outside of their house and just painting it to match. I can’t believe that would work but I’d love to see pictures!